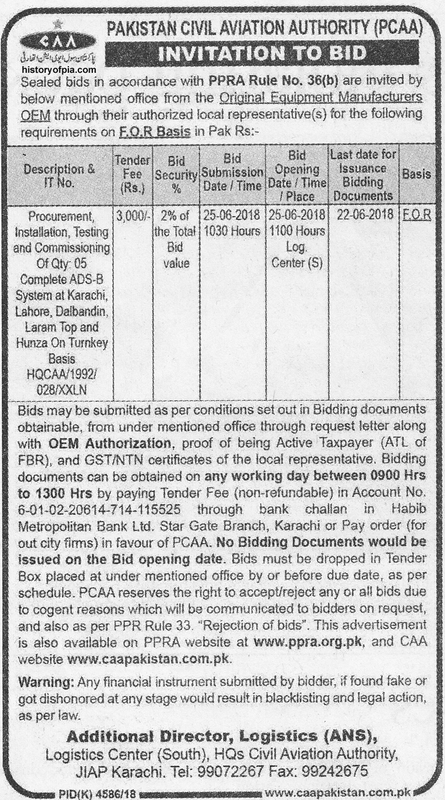 Pakistan Civil Aviation Authority (CAA) tender notice in today's (January 31) newspaper for installation of ADS-B complete system along with its testing & commissioning at Karachi, Lahore, Dalbandin, Laram Top and Hunza. Automatic Dependent Surveillance - Broadcast (ADS-B) is a cooperative surveillance technology in which an aircraft determines its position via satellite navigation and periodically broadcasts it, enabling it to be tracked. The information can be received by air traffic control ground stations as a replacement for secondary radar. It can also be received by other aircraft to provide situational awareness and allow self separation. In compliance with the global mandate of for addressing the coverage issues of grey/blind areas (not falling under regular surveillance) and to augment the existing surveillance coverage of CAA radars, ADS-B stations will soon be established at Karachi, Lahore, Dalbandin, Hunza and Laram Top. Pakistan CAA is in the process of installing ADS-B at different locations to enhance surveillance capability. Are those ADS-B FlightRadar24 radars already installed in Khi and Lhe different from the ones that CAA wants to install? No, they are not, Well, the only difference will be a professional antenna and gain/filtering for better performance. You can build ADSB receiver using a raspberry pi , a tv usb dongle and some copper wire for building a 1090Mhz ground plane antenna. CAA first needs to make ADSB mandatory for all aircrafts flying in Pakistan's airspace.